I’ve been driving out in the desert for ten days now and I have to tell you the only way to get that haze out of your throat is a beer. I’m sure there are better things but I’m way out in woop woop so cold bubbles are a must. Chakra tingles at its best. That certain chill that cascades down your throat, seeps over your shoulders after these long drives out here is bliss. But mind altering substances ain’t for everyone. So I’m taking a rest from the gravel and wilderness with still a long way to go, softie in hand. I’ll begin this post from a roadhouse in the outback of the Northern Territory. Out here, the extreme heat zaps all but your drinking and fly swatting arm. A place where you begin to talk like a Thunderbird puppet. The smaller lip movements the better help stop you from swallowing the buggers. Though it is hard to get wasted out here without some pre-planning. Distance and alcohol restrictions that help the indigenous communities battle the booze hamper personal relaxation. But that is a great thing that is happening out here. Booze taking a back seat, art is paramount. So on this trip there has been no regrets. In these small communities, you go with the flow. In some towns, four is your lot and so you have to party elsewhere. But the publican’s pissed off already that there are too many tourists drinking his beer…*points to self, tiptoes quietly from the bar* These guys are thousands of k’s away from the bigger cities. In the old days I bet these roadhouses saw some ripe action, real toe curling beauties. But I think the days of hosing down the red streets of victims of over indulgence are waning. So back to the big smoke and on a related topic the inevitable hangover. Paper And Ink Zine head honcho Martin Appleby has been compiling for our pleasure, page after page of bodily functions, misadventures and boozy poetry all brought out by the bottle and whatever else these writers got their hands on. Regulars pummel their wit and grit like Joseph Ridgwell and his bambi sweet love story *rolls eyes*, Two Day Old Pony. There is something so refreshing about the character that Joe plays in his literature. Always testing his boundaries with his own brand of realism. Forever searching the ‘Lost Elation’ Joe is one of my favourite storytellers. Zine novella Parts One & Two of his time spent in OZ, The Cross, are available here. His latest novel Jamaica is out soon through Pig Ear Press. Don’t be fooled by the serenity of the river scene surrounding Ian Cusack‘s priceless approach to the beautiful outdoors. He tells it like he sees it and doesn’t care how uncomfortable you might get. The wondrous eyes of Akua Mercy. Her poetry release Magic Spells From The Cosmic Dragon was a strong debut and is available here. I enjoyed the deep observance of Jared A Carnie‘s Between Here And Bed, who’s book Waves will be published by Urbane Publications. No stranger to PIZ is the wonderful wordsmith Jennifer Chardon who is living “in the blur between not remembering and remembering” Stumbling familiar crossroads of happiness or regret, depending on how hard you’ve partied I guess. They all lie under the banner of Unmemorable Memories/Recovery/It Doesn’t Matter Anyway Because You Will Forget This. One positive there at least. Jessie Lynn McMains talks of the years “never hungover because we were always drunk” in Goodbye To Pilsen. Her piece has a real bounce, and website made of “Bone, Ink And Dirty Love” is worth checking out. I adore what she conjured in my mind. Andrew Climance from Squid Ink Publishing doesn’t leave out any nasty bits. Fucked By The Fear is like looking out a window and I feel the need for something stronger to wash the real away. Dean Lilleyman is no stranger to the bar. His novel Billy And The Devil is filled with alcohol fuelled regret. His lil time warp You Are Six reminds me to gear up for The Gospel According To Johnny Bender coming out soon. I loved Ford Dagenham‘s ode to Richard Harris, another treasured collection of mine, Ford’s poetry book Canvay Island Of The Mind is available here. Loads of new voices for me like Wesley Cooke who’s all bovver and breathless with his great opening piece Yetowski Goosecreature. Hosho McCreesh shows us the difference between being Hungover At Work and Hungover In Cannes. Seems to me they are one and the same, fun and melancholic. Renew by Rikki Weir is a dizzying morning after romp of pheromones. Vicki Jarrett’s story Schrodingers Hangover was such a refreshing tale, part revenge, part just can’t take it anymore grin inducing, loved every line. Her short story collection The Way Out will be one to snap up. The Lock Out by Nick Ryle Wright hits hard, the pain and cycle of alcoholism “Please don’t let my piss be pink“. This sat heavily even with the prospect that there is always a chance to change. There are some sweet quickies Samantha Clarke, Yessica Klein and Emily Harrison who’s a double page of similar moods enhanced by each other, a nest of superb web writers have now been discovered. Dave Matthes serves up a mean double with Reaction Time and Strange Rainfall On The Rooftops Of People Watchers and is now on my radar. We also know what Martin Appleby was doing on February 12th 2015 and it ain’t pretty. Hangover Sunrise by John Grochalski age weary record breaker and Detox by Anggo Genorga ponders “a new morning, a new man, a new monster” no better no worse. 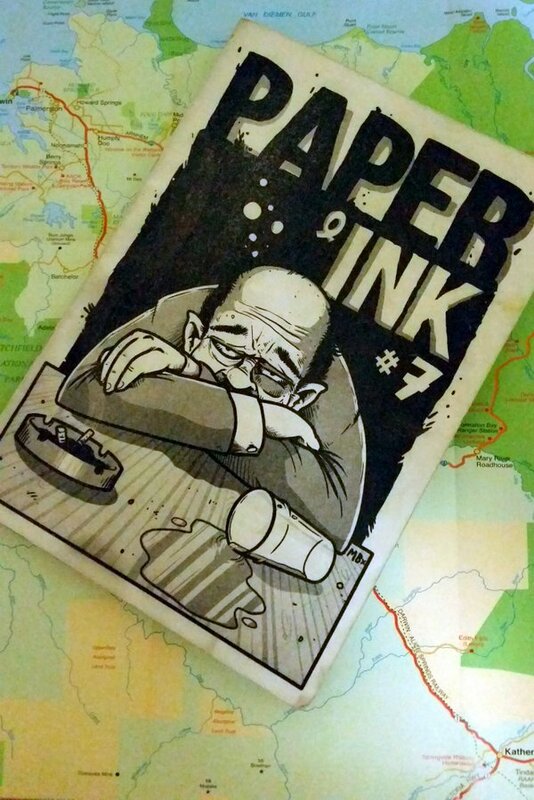 Issue 7 is a balanced bunch of stories, good times, bad times, booze as devil and saviour. Highlight for me was a piece by writer U.V.Ray. A literary hangover that I couldn’t get out of my head. Paradise Place isn’t so much about traditional liquid indulgence, his is a cocktail of so many things and years of experience to tell it. Here we get to throwback a little shot from his new novel Black Cradle soon to be out through Murder Slim Press. Characters Brigette and Billy give us an eyeful of Birmingham life, white line rides, brushes with fame and death. The writing clings like a film of sweat, a numb nihilism that is not for everyone but if you can handle the real thing, keep an eye out for this intense writer. Grab a copy of Paper & Ink here.